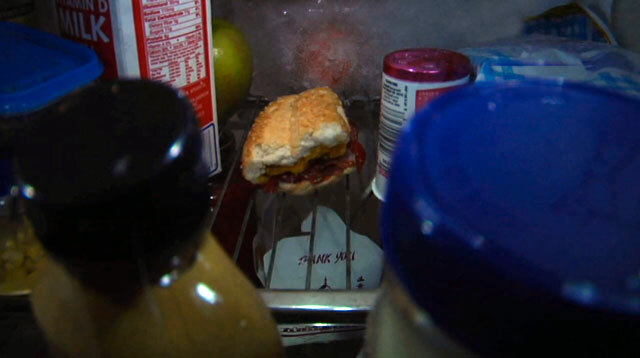 Encroaching ice from a malfunctioning refrigerator is threatening the welfare of all the inhabitants, and its time for the fearful fruit, dairy and leftovers to hunker down and stategize! A War film is the perfect comparison for Meltdown, and the reason why this absurdist gem is so entertaining. Encroaching ice from a malfunctioning refrigerator is threatening the welfare of all the inhabitants, and its time for the fearful fruit, dairy and leftovers (animated and voiced to hilarious effect by a stellar cast), to hunker down in the foxhole and strategize. Ham Sandwich (Arrested Development’s David Cross) takes the lead (after all, he’s made up of the best of them!) galvanizing the troops to overcome fear and Celery’s grumpy pessimism. But, when the apartment owner’s hunger takes out their leader, do the rest of this motley crew have what it takes to rise to the occasion? Dave Green directs, and he knows funny. We don’t feature a lot of comedy shorts, because, well, comedy is hard. If you can do funny, then work in TV or features, because frankly, they could use the help. However, buoyed by the accomplished cast, Meltdown is chock full of hilarious situations and killer one-liners, helping to make palatable the inherently dark and twisted premise of anthropomorphic food. Cracking 100K views in a little over 3 days online, the film has really struck a chord with online audiences after an accomplished festival run. Green had the foresight to see potential for this theme, mentioning to me that he has wrapped shooting on a new film starring a Ham Sandwich that “…may or may not be cursed. And it may or may not involve time travel.” That film should be coming online at Atom soon, and we”l be sure to give you and update when it does. In the meantime you can follow Meltdown on Facebook, or Dave on Twitter.